It’s got it all: the looks and the tone of the iconic Cosmograph Daytona. Not only the case design but also the dial with its subsidiary dials and hour markers closely resemble Rolex’s widely acclaimed chronograph. But this highly attractive wristwatch, made by Ulysse Nardin, has features of its own that make it singularly important. First, the Reference 7536-2 is slightly larger than its peer. The watch is housed in a masculine stainless steel round case, with the pleasing proportions and balance found on the most desirable watches from the 1960s. But at 38mm in diameter, the watch offers just a little more presence on the wrist. Second, the black bezel on the present piece is itself noteworthy. While it looks like an insert, turning the watch sideways reveals the bezel is made from a single piece of anodized aluminum which meets the surface of the caseband and lugs. Finally, the watch is incredibly rare. 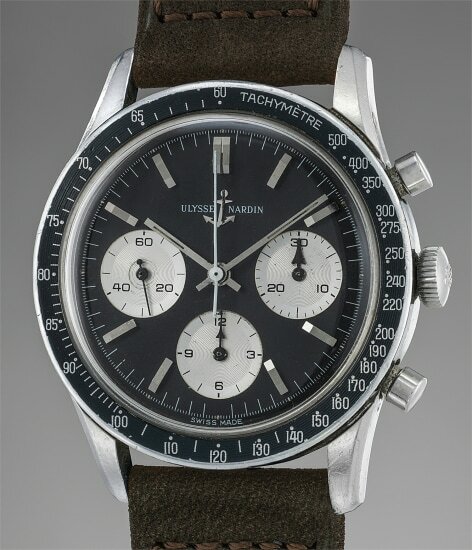 Unlike similar chronographs, the Reference 7536-2 failed to find a permanent place in its manufacturer’s production. Very few such models have been discovered, making the present piece, found in overall very good condition, a very desirable chronograph.